Beer recipes can be inspired from a wide variety of different sources. These can range from brewer memories, such as Fat Tire, brewing practices, such as 90 Minute IPA, regulatory events, like Censored Amber Ale, and many others. These inspirations do not just apply to professional brewers, but are actively found within the homebrewing community as well. I recently had the pleasure of designing a beer recipe for a group brew with adult members of a community acting company my family has long been involved with - Black Box Players. For several years now, members of the acting company who are interested in beer have asked me about homebrewing. The queries did not tend to run too deep, other than those who have since started homebrewing, but there was definitely a general curiosity One evening, one of the actors asked if there were any beer styles that sounded like "Black Box." Someone else responded that "box" and "bock" are similar and wondered if there was a "black bock" beer style. This simple conversation eventually worked its way into a group brew day demonstration, with the intention of distributing finished beer to interested members of the acting company. It fell to me, and another homebrewer associated with Black Box, to develop a recipe around this concept. The concept clearly centered around a bock beer style. Given the nature of the brewing event, we quickly decided to go with the traditional bock style, to avoid the complexity and longer aging times associated with the higher gravity versions. 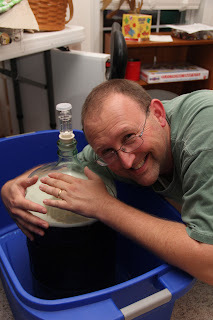 To start with, I looked at several different bock recipes, including those found on the BeerSmith recipe site, Homebrew Talk, and Brew Your Own's archives. In the end, I went with the base recipe found in Brewing Classic Styles, which is my go-to recipe source for styles I have not brewed previously. The other obvious criteria from the recipe concept would the mechanism to make the beer very dark in color. There are a number of grains and additives that can do this, but we still wanted the beer to still taste like a bock. So, anything that added excessive roast or chocolate characters, like roast barley or chocolate malt, were out. In the end, I added a pound of Carafa III Special, which is a de-husked malt that lacks the roast quality found in other dark malts. But I did not want to stop there, as there were many other aspects and stories of the acting company that could be incorporated into the recipe. We decided to add a wood character to the beer because the stage we act on was constructed of wood. This would be accomplished through the use of oak cubes, which should give a multidimensional oak character to the beer. Additionally, we elected to soak the oak cubes in scotch, as there were some stories about "tours of Scotland" associated with older members of the company. There was also consideration of a "smoke" element being added to the beer, given some of the hot rehearsals in un-air-conditioned spaces during the summer, but that was discarded because smoke flavors are an acquired taste and we were distributing the beer to a number of people. The brew day occurred a week ago, in-spite of having to relocate the brew session to my local homebrew shop because our house did not have power after a snow storm. It was a fun day and the black bock is fermenting away now, awaiting the addition of Scotch-soaked oak cubes in secondary. Apologies for not providing some pictures of the day, but time got away from me. It has been a fun process so far and hope the acting company does other beers together in the future. Have you ever developed a beer recipe on a theme? If so, leave a comment and tell us about it. Poll: Favorite Homegrown Hop Varietal? Poll: Favorite Season To Homebrew Beer?